An artist’s rendering of Harbor Pointe Senior Living facility at Bristol Street and Bayview Place. 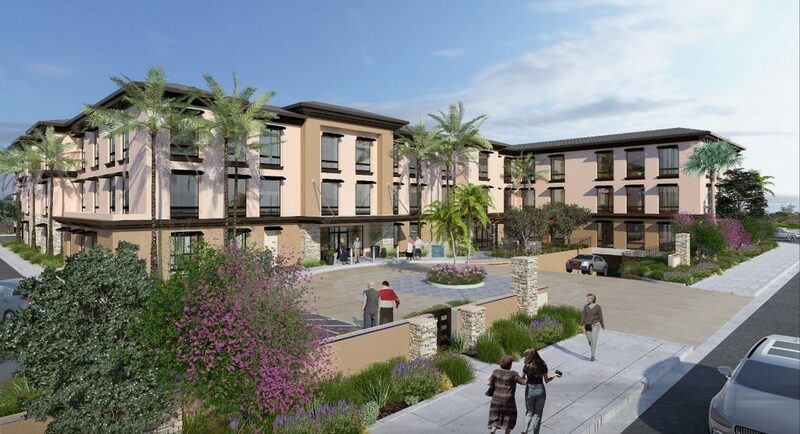 A senior care facility proposed in Newport Beach continued on its path toward possible development following unanimous approval by a John Wayne Airport panel, but not without some criticism from both the public and board members. The Airport Land Use Commission met Thursday in the Airport Commission Hearing Room on Airway Avenue in Costa Mesa. The group voted 7-0 in approval of the proposed Harbor Pointe Senior Living facility. 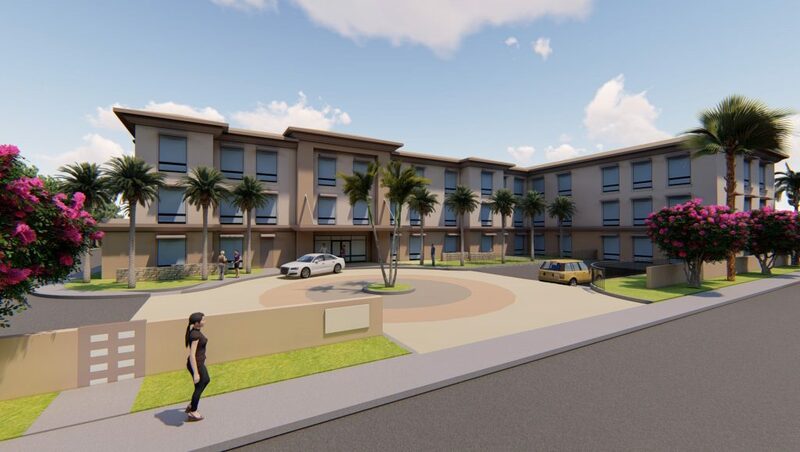 The proposed project is a three-story, 84,517-square-foot, 101-unit, 120-bed combined senior assisted living and memory care facility. The plan calls for 81 assisted living units and 20 memory care units. Site location is 1.5 acres on the southwest corner of Bristol Street and Bayview Place. The proposed project includes demolition of the existing Kitayama restaurant building. The proposed project is approximately .75 miles east of the airport. 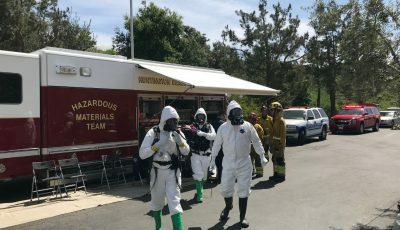 Several members of ALUC noted that this location is not suited for residential, particularly a facility with elderly and memory care patients. A move from commercial to residential in this area is a move in the wrong direction, commented Chairman Gerald Bresnahan. “If I had my way, we’d say ‘No’ to this project because it’s a poor place for residential,” Bresnahan said. It’s a step backward, he added. However, as he and a few other commissioners agreed, from an airport land use standpoint, the project is consistent with their required documents, including the JWA Airport Environs Land Use Plan. 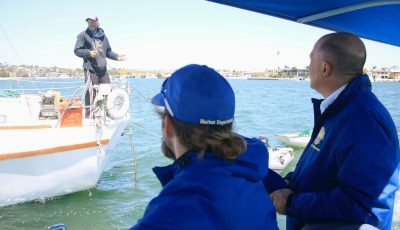 They have to consider what actually falls under the Airport Land Use Commission’s authority, Commissioner and Newport Beach City Councilman Jeff Herdman pointed out. “This project, from an airport land use commission purview, is a-ok,” Herdman said, the opinion of whether or not it’s the best use of the land is not in their scope as a Commission. They have tried to keep schools, hospitals, and residential outside the “Community Noise Equivalent Level Noise Contour” (where the project is located) area, “but developers keep finding a way,” added Commissioner Stephen Beverburg. It’s a valuable piece of property, he added. “The best we can do is try to hold the line,” Beverburg said. Beverburg agreed that he doesn’t feel this the best project for this site, but that the AELUP doesn’t prevent them from approving it. This is a residential project within in an area where general aviation airplanes will fly over “quite frequently,” Bresnahan explained. 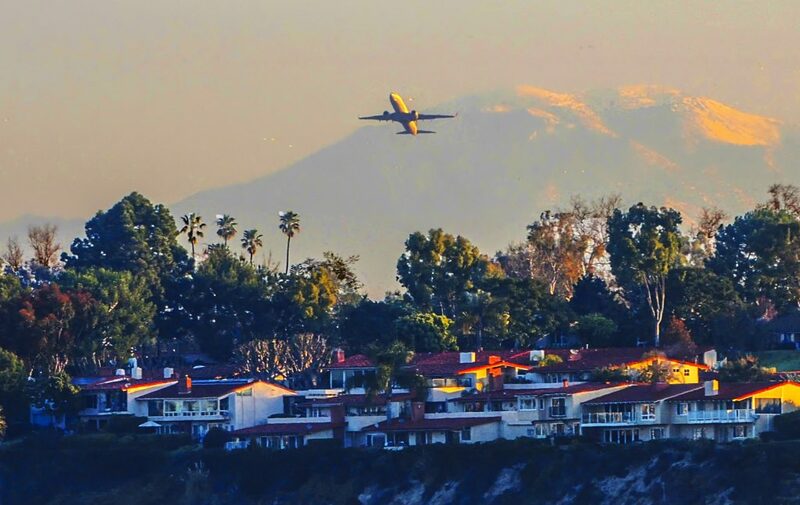 A plane takes off from John Wayne Airport, flying over Newport Beach homes and the Upper Newport Bay. A few Commissioners and members of the public pointed out that loud noises could disturb the memory care residents. Anne Fox, representative for the applicant, CenterPointe Senior Living, LLC, confirmed that design measures will be taken to mitigate the noise. The memory care portion of the facility will be secure and on the ground floor, she noted. There will be an interior courtyard outdoor amenity on the first floor, she added. Airport Land Use Commission staff suggested that Harbor Pointe include some additional noise mitigation measures, including submitting an acoustical analysis acceptable by the city that demonstrates that the design would provide an interior noise level of 45 decibels or less in all habitable rooms. Herdman asked Fox how they were going to ensure the 45-decibel level requirement. Although Fox couldn’t answer specifically what type of architectural or other measures would be used, she did confirm that they would submit reports during the process. Commissioner Jeff Matthews noted that he recently stayed at a hotel near the Minneapolis airport and couldn’t hear the planes “at all.” There are materials out there that work, he said. Staff also added the JWA land use plan’s recommendation that any designated outdoor common or recreational areas provide signage informing the public of the presence of operating aircraft. Loud noises can be greatly disturbing for memory care facility residents, commented Newport Beach residents Paul and Ronnie Watkins. “These folks have challenges,” Paul Watkins said, noting that many may have dementia, memory loss, or Alzheimer’s. They are concerned that the loud noises will negatively impact the elderly residents in the facility, he said. “I don’t think an outdoor sign is going to do the trick,” commented Watkins, pointing out that the airplanes taking off from JWA just beyond the building’s parking lot drowned out speakers. Opponents have also argued that the planning and zoning changes the projects needs are not appropriate. The application includes requests for amendments to the general plan and planned community development zoning. The project would need to change the land-use designation of the site from its current CO-G (commercial office) purpose of use to a PI (private institution). It would also need to amend a rule to replace the existing development limits of 8,000 square feet for a restaurant or 70,000 square feet for offices, to 85,000 square feet for a residential care facility for the elderly. An previous version of an artist’s rendering of Harbor Pointe Senior Living facility at Bristol Street and Bayview Place. It’s inconsistent with the airport LUP and with the community, Paul Watkins noted. The original zoning is more appropriate for the property, Ronnie Watkins added. Local Baycrest resident Lyle Brakob agreed. 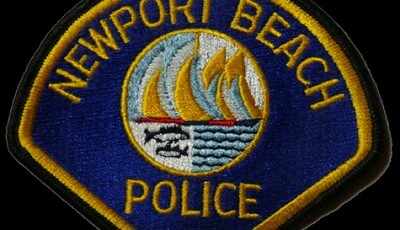 Although supporters have argued that there is a need for this type of facility in Newport Beach. 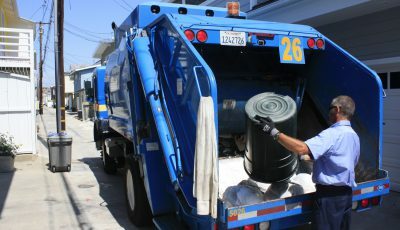 They have also noted that the applicant made changes in an effort to make it more compatible. The senior living project, which was first proposed and heavily criticized by locals in 2016, returned to the Planning Commission late last year with some notable differences, like the height reduction. The project was discussed for several hours during a Planning Commission study session on Sept. 13 and as a public hearing on Dec. 6. During the December meeting, the Commission unanimously approved the project and recommended it to the City Council. Proponents also pointed out that other potential projects, like an office building, would increase traffic in the area. In the most recent action on Thursday, the Airport Land Use Commission ultimately agreed with the airport staff recommendation that the project is consistent with the JWA Airport Environs Land Use Plan. The project will likely be heard at the Feb. 12 Council meeting.